The Cardoon is a thistle-like plant in the same family as the artichoke, which explains why its stalk is so similar in flavor. The cardoon is a very popular ingredient in Mediterranean style cooking, where it is native and has been cultivated since ancient times. However, cardoons are considered a weed in Australia and California because of its invasive nature and adaptability to dry climates. In Portugal, cardoons are used as a vegetarian source of enzymes for cheese production, which gives the cheese a distinct earthy and herbaceous taste. Cardoons are only edible when cooked. To cook cardoons, trim off any leaves or thorns, and peel the stalks with a vegetable peeler to remove the indigestible fibers. 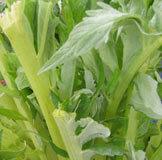 Cardoons discolor when cut; place cut pieces in cold water with lemon juice to keep them from turning brown. Cardoons can be braised, sautéed, boiled in soups and stews, or dipped in batter and deep fried. Depending on the age of the stalks, they can take up to an hour to get soft and tender enough to eat.